There's a reason why Office 365 is considered the most popular cloud-based productivity suite. Microsoft's offering is bursting with features that can seriously improve a business of any size. But we're not going to sit here and claim that Office 365 is perfect because no program is ever released without any flaws. Even though Microsoft's technicians and developers have been hammering away to fine-tune every feature, here are the 4 main Office 365 disadvantages you need to be aware of. While these aren't disadvantages that can have a massive impact on your organisation because of the workarounds available, it's still important to be aware of the problems you might face. Office 365 is cloud-based, meaning your entire organisation will be using the internet to access and use the apps. Sadly, none of us can control the internet and there are no guarantees that the connection won't be poor. So, this means Office 365 will work much better for organisations with faster and reliable internet. However, the internet is a must when trying to use certain apps. This means you won't be able to access any important files or data, which can be critical if you have deadlines you need to meet. However, as frustrating as a poor internet connection might be, it shouldn't be enough to deter you away from Office 365. Remember the loopholes we mentioned? One of them applies here because the type of Office 365 plan you select means internet worries might not be something your organisation will need to be concerned about. Most Office 365 plans come with access to full desktop versions of Office programs. These include the firm favourites in Word, PowerPoint and Excel, so you can sync your files to your desktop even if you don't have any access to the internet, However, that does mean you won't be able to access your emails without any internet. But you won't be suffering from any downtime, as your employees can simply switch to the desktop programs and carry on as usual. However, there is another workaround for this. It would be beneficial to sync your systems to your OneDrive accounts. This is so all of your changes are saved and can be synced when you're able to access the internet again without losing valuable work. Just make sure you go online at least once every 30 days so your subscription remains active and the apps don't deactivate. Having trouble keeping up with some of what you've read? Don't worry. We've tried our best to make everything as simple as possible. But if you want an easier understanding of terms you come across, check out our jargon buster which is jam-packed with terms that make it easy to understand and digest. This is another small disadvantage which can have an impact on your business. It might even upset your finance team too. A majority of Office 365 users don't actually use everything Office 365 has on offer, so they're not using it to its full advantage. Depending on the size of your organisation, it's claimed that most users are only using 20% of the functionalities. The primary uses include email, file storage and access to Office programs - that's despite it having so many more advanced features on offer. While's there's nothing wrong with this, it does mean you could end up paying a lot more than what you need to, especially if you don't realise this beforehand. If analytics tools, web and app development and advanced compliance tools aren't what your users will need or aren't ever using, then it's worth considering moving down to a different plan. This can then result in another disadvantage, because if you're having users switch between plans, then there might be limitations to what they can no longer do. This can range from accessing certain programs to sending or receiving a large volume of emails on a daily basis. So, it's a good idea to check every few months for which parts of Office are actually being used. As you can then decide which employees need to upgrade to a more advanced plan and which users need to downgrade to a more basic package. Although you receive all of the updates and latest versions of Office 365, depending on the plan chosen, realising that Office 365 might not be compatible with your organisation's systems can be quite overwhelming. This is because the latest and best updates aren't usually compatible with line-of-business applications and enterprise resource planning systems. If your critical systems aren't compatible with the powerhouse that is Office 365, then it's not something you can implement. Office 365 includes Windows 10 as an operating system. So, if you have much older computers or laptops in your company then it could be time to upgrade to newer machines before you can begin to use it effectively. Although buying new systems can increase overall costs, devices with Windows 7 or Windows 8 should be able to run Office 365 as normal. While migrating to Office 365 can be a frustrating issue if your devices aren't compatible, there are still ways around it to fix the issue and ease the transition. Then there's the big one. If your organisation is one that has so much data to deal with that it can be difficult to cope, then it's refreshing to have Microsoft control and manage the security aspects. However, this level of control does have some drawbacks as not everyone is going to be comfortable with having data controlled by someone other than your employees. Your organisation's data will be hosted in Microsoft's data centre if you make the switch. Microsoft has implemented a series of safety and management regulations, where the restrictions might interfere with your company's daily activities. This might include the inability to import XML files, for example. You might just prefer to keep all of your data with your own company for peace of mind, which is available when signing up for Enterprise licensing. However, while you have every right to be concerned about data leaving your premises, part of the reason why the switch is made to Office 365 is because of the advanced security features that aren't available elsewhere. Office 365 does have plenty of advantages that can make the decision to switch easier. Still, it's always nice to see both sides of the story and know what the negatives are before diving in at the deep end and implementing Office 365 in your organisation. Although Office 365 does have its disadvantages, it shouldn't be a major cause for concern for organisations like yours. 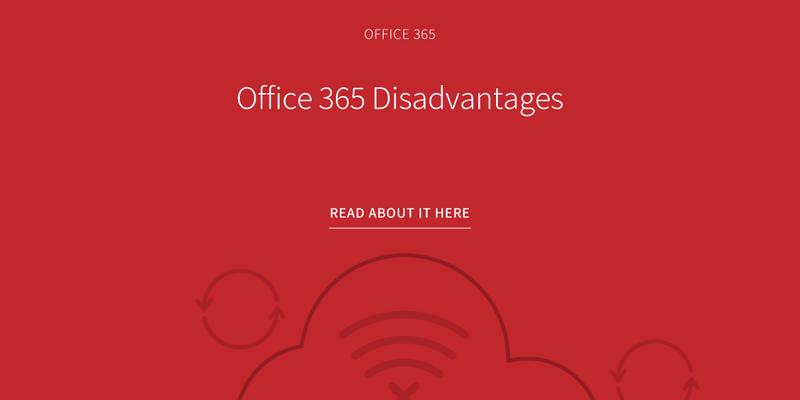 The fact is, the Office 365 advantages clearly outweigh the disadvantages. It's also why Microsoft's creation is proving to be the most popular productivity suite around. By implementing Office 365, your workforce can work from anywhere which is even more convenient if you've selected a plan where you receive the desktop applications. That means you won't even need the internet to get work completed on time. Most users will have also grown up with Office, so you won't be throwing big changes their way. Even though Office continues to improve and you always receive the latest programs without paying extra, the main functions remain the same so your team can easily work with what they know and are familiar with. However, it's the robust security features which makes Office 365 even more reliable. This ranges from the basic two-step authentication features right through to intelligent compliance solutions. The cutting-edge security features are just one of many aspects of Office 365 that helps get it a big approval rating from us at Silverbug. Check out our more in-depth blog on the 7 key advantages of Office 365. How Does Office 365 Rank Against G Suite and Workplace? It's always worth considering all your options. So, how does Office 365 hold up against Google's and Zoho's version? We've compiled a handy feature comparison to help you decide which one is best for you and this will be available shortly. The truth is, G Suite and Zoho both offer lots of these features themselves. They even keep up with Microsoft on a couple of features. Our comparison sheet will show you where each platform shines. Until it's ready, why not speak to somebody in our team to discuss which option is right for you. Or, if you prefer, take a look at our guide to ransomware protection.